I haven't done a lipstick review in quite a while! These are one of my favourite posts to make. Of course, I'm coming back with a liquid matte lipstick because what's better than that? As I've mentioned in my confidence post, I've been laying off makeup for a while to let my natural skin breathe. Nevertheless, whilst reorganising my makeup I found that I haven't tried out this ELF lipstick! This is completely unacceptable. I couldn't resist the temptation to try it as liquid matte lipsticks are my all time favourite. On my pigmented lips, the color appears to be a muted toupey purple which compliments darker skin tones beautifully. It didn't appear to wash me out regardless of it's almost gray-like undertone. It's a gorgeous shade to welcome the autumn/winter months with. This lipstick color does not bleed or transfer which is a huge plus. The application of this lipstick is very impressive. It feels non-existent and has a creamy texture due to the presence of vitamin E. It didn't feel tight or highlight dips/cracks in the lips which is perfect during winter when moisture is sucked out. Once dried, it appears completely matte and opaque with just one layer. It dries nearly instantaneously so quick application to ensure minimal clumping is necessary. The applicator (don't mind my sloppy job in the picture because I rushed in the morning) allows immense precision with its diamond shape; making it great for giving the appearance of bigger lips with subtle over lining. However, one qualm I do have is that the formula is very drying. This was disappointing considering its extremely lightweight consistency. If at hand, applying lip balm throughout the day will help maintain its smooth appearance. Usually, I prefer a non-fuss makeup look so this is a disadvantage. Within a couple of hours I looked like I've never seen water in my life. The price tag doesn't help the lipstick's cause considering it is still quite expensive for a drug-store brand. In essence, I am hesitant in purchasing more colors for this particular line as for £6.00 I could purchase a NYX Matte Lip Cream which is stupendous quality. 8:00am: I applied one even layer of the lipstick sloppily on my lips because I was a bit pushed for time. I was pleasantly surprised at the shade which appears slightly different to the actual bottle and online swatch. It didn't feel drying, uncomfortable, or sticky. Time to test out its wear during a standard university day. 10:00am: Oh no. I look like I've been sent to the Sahara dessert with no fluids. My natural lips don't even appear this cracked. It was a bit shocking as the lipstick is advertised to have vitamin E infused to aid in conditioning and nourishment. Within 2 hours it most certainly didn't look like it. I began to feel subconscious during uni in case anyone noticed and felt the need to offer me a drink. Luckily, one sweet girl complimented the color which is certainly a good sign. 12:00pm: Early lunch! One of the best feelings is finishing a lecture before the scheduled end time. My mom packs my lunch for me and makes me a 500mL flask of coffee to last me the day. After finishing my second cup and lunch, I noticed fading on the inner portion of my lips. Though the scaly, dry, appearance seems to have reduced, it gives off an uneven impression. Unfortunately, I didn't think to bring my lipstick with me for the day as I hardly reapply makeup so I had to leave it as is. In any other circumstance, I would either remove the lipstick or touch-up at this point. 1:30pm: I decided to make a quick beeline for the bathroom before my next class to check the status of my lips. It looks similar to how it did after lunch but with slightly more fading near the centre of the lips. 4:00pm: Home sweet home. There is nearly no trace of me having a matte liquid lipstick on since the morning bar a slight overall tint on the outer corners of my lips. Overall, the longevity of this liquid matte lipstick is quite short at about 3 hours considering the price. In addition, it is extremely drying even though the application process is a dream. As a result, I most likely will not be purchasing lipsticks from this line in the future but ELF is still one of my favorite brands. On my fitness journey (which hasn't even lasted a year), I discovered one of the hardest things to achieve: weight loss and muscle building simultaneously. Personally, I would like slim and toned thighs paired up with a bubbly derriere. It may feel near impossible because one requires a calorie deficit diet and the other the exact opposite. The magical thing about weight loss is that you can target muscle growth but not fat loss. If you don't have a gym membership or weights, and prefer to work out at home in your free time, here are four exercises which will work out the muscles in your glutes whilst increasing your heart rate. Just a warning, these exercises are torture but incredible for multiple muscle groups: hamstrings, quads, and glutes primarily. I know, I know. They're the bane of my exercise routine too. This is aimed at increasing endurance causing you to break loads of sweat whilst elevating your heart rate. Your legs should feel as though an electric shock is running through them with each step and your heart is about to explode out of your chest. Adding a jumping motion to your squatting routine is great for instilling some cardio. You will really feel a burn in your bottom as well as upper thighs. Like the old saying goes, 'drop it like its squat'! For squat jumps simply drop into the normal squat/sitting position and drive into the air; repeating this motion multiple times. For a Bulgarian split squat jump, drop down as low as you can and jump upwards, similar to a normal squat jump but one leg stays elevated. I find that this one not only works out the muscle groups as I've mentioned previously, but it really tests your balance. It's okay to have to grab onto something whilst doing this movement. Make sure that you really drop into a lunge with your knee just centimetres from the ground after each jump to really get your glutes involved and work those muscles. These are great for not only your quads, hamstrings, and glutes, but also your arms, chest and hip abductors (which is great for that side-bum game). Here is a routine that I follow, especially on my lazy days where I don't want to do something too structured or time consuming. This is a great warm up to reduce chances of muscle tear or pain. I switch between doing a bit of dancing for 10 minutes or jumping jacks for 5 minutes. To ensure that you are engaging your glutes throughout the duration of your exercise regime, it is important to activate them at the start of your work out. Try and do this routine about 3 times a week alongside more intense glute workouts on days where you don't want to do cardio for faster results on your derriere. Make sure to take rest days so your muscles can repair, tighter, stronger, and more toned than before! Confidence is a muscle. It requires constant exercise for visible results. There are endless articles, self-help books, sessions, etc. available to guide individuals on their journey to self love. I am not where I want to be in terms of my personal morale but feel these habits will soon equip me with the ability to greet the mirror with a smile. 1. Embrace your natural beauty. This is the most impactful and difficult to carry out. For the past few weeks I have made it a point to avoid heat on my hair (as mentioned in my hair care routine here) to welcome its natural texture. I have also tried to eliminate numerous makeup products. My daily makeup routine encompasses of: curling my eyelashes with an eyelash curler, lip balm, and moisturiser. This may not be easy to carry out and is highly dependent on your line of work. Therefore, start by switching out products such as lipstick for tinted lip balm and bb creams instead of foundation. These are baby steps one can take to help adore their natural beauty. 2. Read. I love to be wrapped up in bed with my laptop, surfing youtube for hours on end. This is mind-numbing. 9 times out of 10 the brain is not being stimulated and it's passive-enjoyment. When I was younger, I was blessed to have an endless array of books on my shelf. Like a Desi aunty and a TV drama, you wouldn't be able to get through to me. It's so vital that we, as individuals, realise that learning should never stop. We have the capacity to access a wealth of knowledge at our finger tips. I am a victim of being addicted to devices as well but have now made it a point to limit my screen time. Reading more often has positively impacted my confidence. I find that I am participating more in conversations, especially surrounding current events. In addition, I've fallen in love with escaping reality into the pages of a book like I did when I was little. Whilst attempting to branch out in what I read (moving from Buzzfeed articles to autobiographies), my imagination and perspective on different matters are challenged On a final point, intelligence (with humility) is by far one of the most appealing characteristics one can have. 3. Exercise. A bad day doesn't dictate a bad life, though it often feels that way in the moment. I find myself drowning in a sea of despairing thoughts; creeping up on me like a deadline for an assignment. Completely unexpected. I remember past memories which act as the foundation for my knocked confidence. To tackle this, I've been channeling that energy into exercise. Rather than wasting time crying over what cannot be changed, I will work out. My confidence surges after I'm dripping in sweat with achy muscles. I feel invincible. That bad energy has burned out of me. This is a fantastic method to overcome insecurities. Obviously, make it a point to not overexercise. 4. Dress for comfort. I take pride in dressing rather modestly. I don't like plunging necklines, tight tops, and loud prints. It's not my aesthetic. 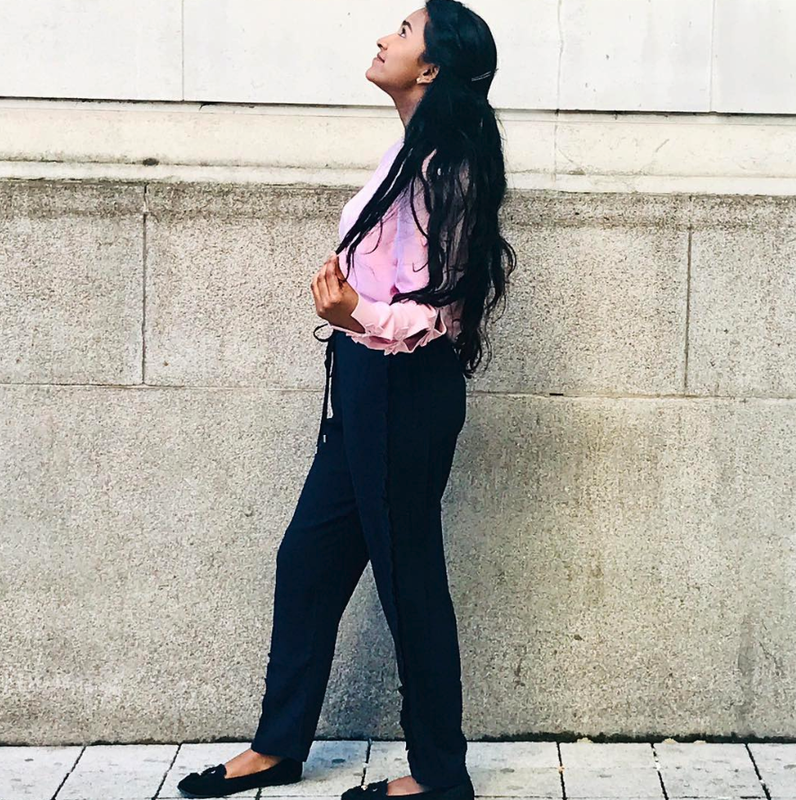 The moment I started dressing to impress myself, rather than others, I found what I felt the most secure in. There is no point sporting a classy, revealing number if you are visibly uncomfortable. Similarly, if you are someone that finds loose and baggy clothes ill-fitting, then don't wear it. No one wants to look like a potato sack. You don't wear the clothes but they wear you. They will take shape depending on your state of mind. 5. Find a passion or hobby. Sometimes lack of confidence can coincide with lack of purpose. I've only recently found mine at the age of 20/21. You will stumble upon this in the most unexpected manner. Researching and doing activities are different methods to find your passion. It doesn't have to be anything crazy or ground breaking. It can be as simple as reading books. Perhaps you love books so much you may make it a habit to write reviews. It could be animals and you want to engage in volunteer work centralised around animal involvement. As minor or major as it may seem, all passions have a place on this planet as long as you are not harming/hurting yourself or others. This does not have to be a career choice. It can simply be a hobby that you enjoy taking part. 6. Learn something new. This may or may not fall in line with finding your passion. I use to feel I am absent in a lot of qualities. In all honesty, I thought I was quite a boring character. 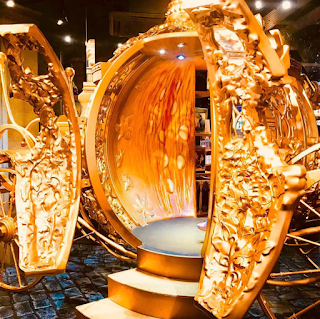 However, looking at myself from a third person point of view, there are a lot of things I like to dabble in whether it be this blog, writing, drawing, and dancing. A new skill I wish to acquire is calligraphy. Thus, learn something new whatever it may be: cooking/baking, a new language, or even oragami. 7. Treat yourself. Every Sunday I have a 'Sunday Spa day' which is as cheesy as it sounds. I will treat myself by taking a hot shower or bath, a face and hair mask, and lather myself with beautiful scented products. You deserve to feel like a million dollars. Be selfish. Every now and then, merit yourself. This can be done by going and having a luxury spa day or outing, but if you're a student like me, buy yourself something you like such as a scarf, dessert, or a book. These are gentle reminders to ourselves to remind us of our self worth. Show yourself gratitude, appreciation, and respect. Take care of yourself. 8. Surround yourself with people who value your true self. The people you are with directly influence your self-assurance. Those around you should not be demeaning, humiliating, and shattering of your confidence. Don't change for anyone. Rather, be around those who lift you to be and do better, whilst appreciating who you are at present. We don't want 'yes men' that blindly agree and do as we say. It is vital that individuals inform us of when we are doing wrong otherwise our growth is hindered. Nevertheless, if the people ruin one's belief in themselves, then the circle needs to change immediately. The crowd plays a huge role, and can take a huge toll. These products have helped me in loving my natural hair texture, smoothing and controlling it to a more presentable state. I've even ditched all hot-tools and am taking on the 'No Heat for Weeks' challenge to see how long I can go before caving into using a styler. I am wearing my hair naturally and feeling confident and happy in the state that I am in! Trust me, I was someone that would envy individuals with gorgeous ringlets, beach waves, curls for days, or sleek straight hair. However, I am beginning to enjoy embracing my natural beauty and hope that this post will inspire and help you to follow in these footsteps. 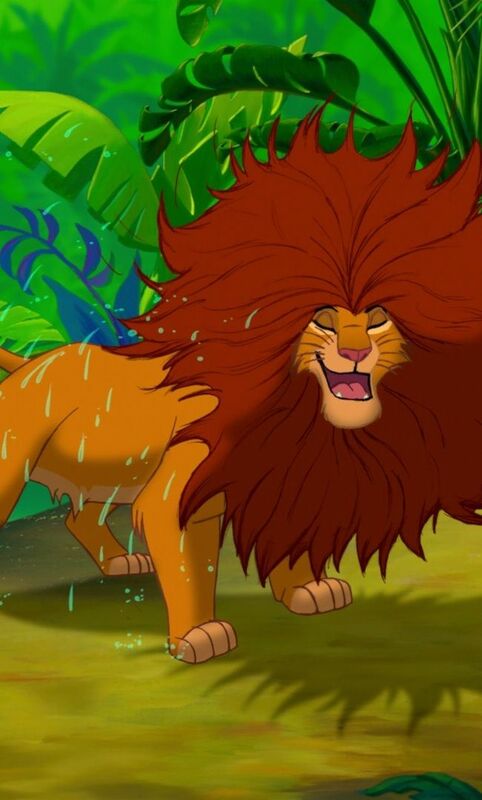 You may be wondering why I use a thickening shampoo when I already have naturally thick and voluminous hair. 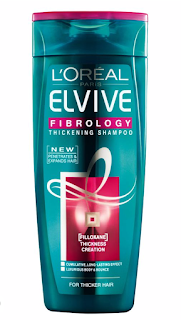 This shampoo appears to help strengthen my hair follicles; giving them a healthier appearance. 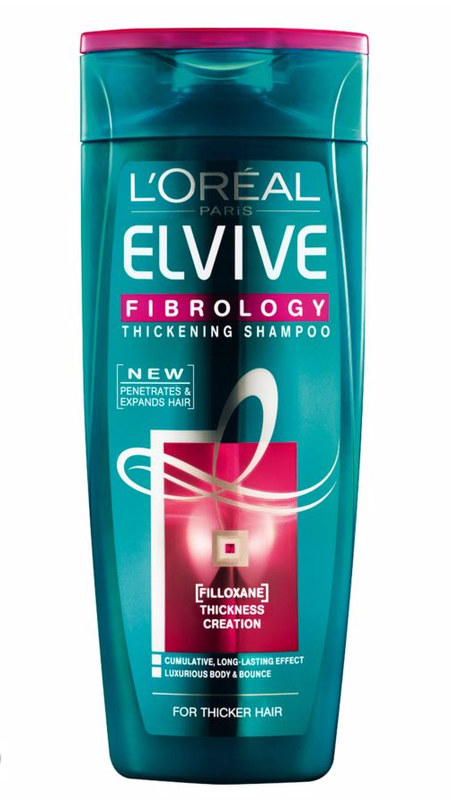 I've been using the Elvive line by L'oreal for a couple of years now, jumping between products, but this is the one which I find has had the most dramatic effect in a short period of time. It has made my hair look more voluminous and bouncy rather than defying gravity with frizz upon the presence of humidity. I highly recommend this if you want a fuller looking head of hair. I prefer to pair up my conditioners with the complementing shampoo. Usually, products work better in conjunction with each other (or it's just a very clever marketing technique). Nevertheless, this conditioner helps soften the appearance of my hair. It gives it bounce whilst assisting with thickness and longevity of the hair strands. 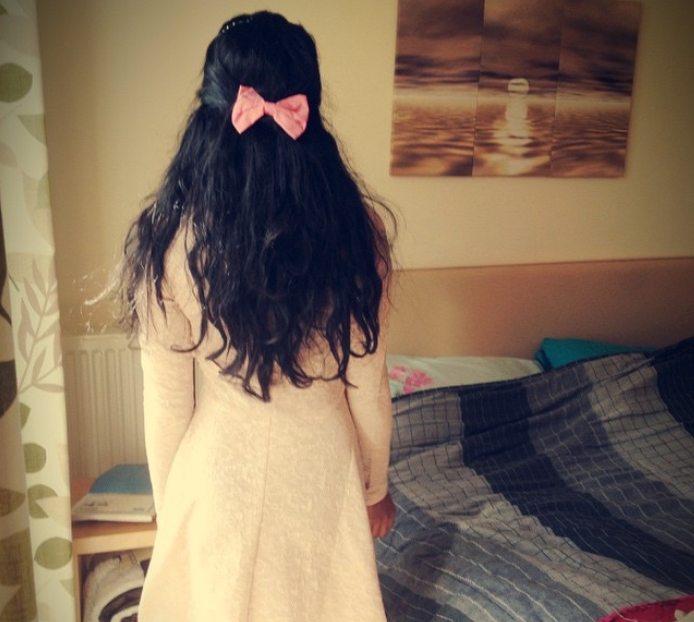 At the touch, my hair is softer and appears lighter rather than dragged down the weight of it all. I take about 50p size amount on the palm of my hand and work in my hair from the eye-level down. 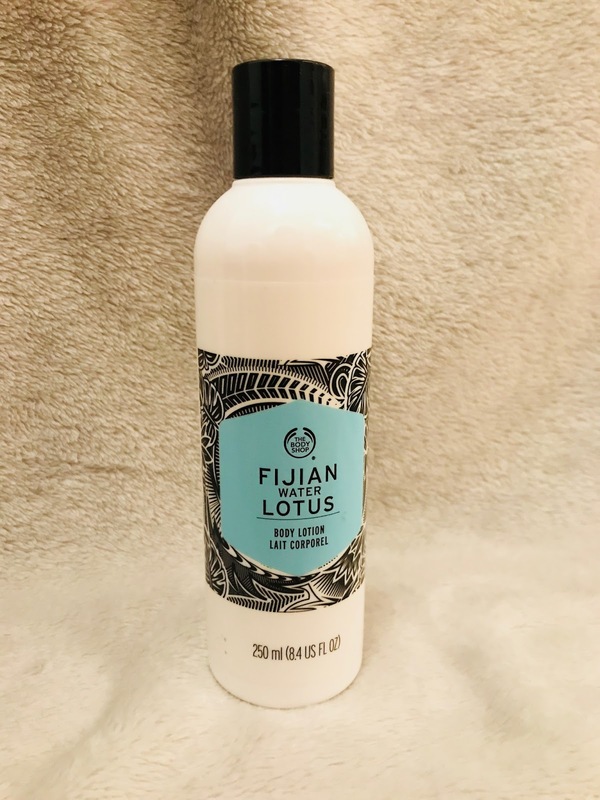 You don't want to apply this at the roots, though it says you can do on the bottle, as I find conditioner at the roots tends to weigh down the hair. Furthermore, freshly growing hair at the roots does not require intensive treatment via chemicals. The natural oils produced by the scalp is enough nourishment. This is where the magic happens. The shine, silky-ness, and smoothing of my hair is most probability credited to this product. I use the Parachute coconut oil which can be found here which I have genuinely been using since I was 5 years old or since I had any hair. My grandmother, my mother, and everyone in between have attacked my hair with this product from a young age. My mom has ventured into Vatika products that you can find at Superdrug online as well as Tesco groceries. Once a week, I will apply this very thoroughly, deep into the roots to the tip of the hair strands. I will then braid my hair and wrap it into a bun to ensure that the oils can soak overnight or for a few hours depending on when I plan to wash my hair (usually Friday). 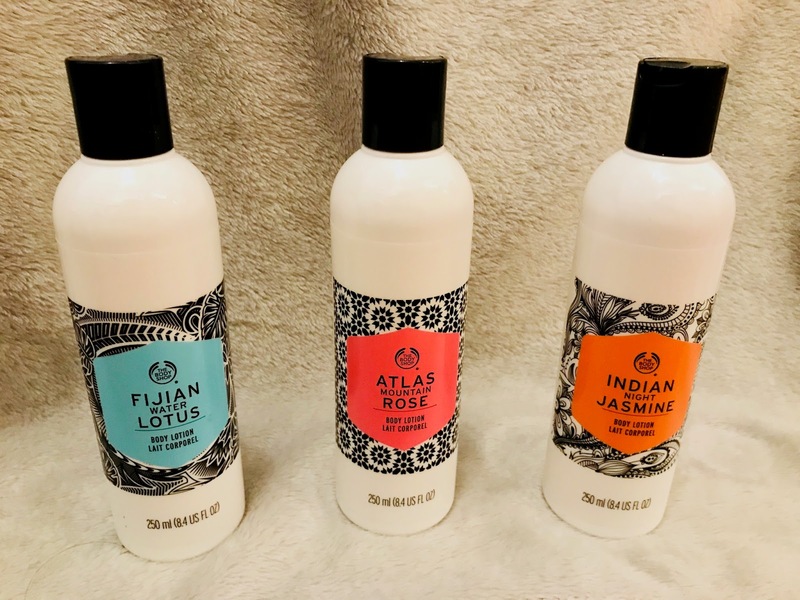 The only downside is the scent which is quite pungent and that you would need to wash your hair twice with shampoo to ensure you have no residue left over. Drink water. This goes without saying. Wash your hair early in the day and let it air dry. Especially if you are not going out and spending your time indoors, there is no need to apply unnecessary heat. If you wash your hair at night, sleep on a towel or satin pillow. I've personally found this to help reduce frizz. Do not erratically towel dry your hair. This can increase frizz. Plait/Braid your dry hair before you sleep. I found that doing this naturally controls the natural texture of my hair, relaxing the curls of my hair. In addition, it makes for an adorable hairstyle in the morning when you unbraid it, meaning you don't need any styling tools! If you don't like braids, you can twist your hair for natural waves. If you don't the appearance of crimps, then you can twist your hair into what relates to two plaits which heavily relaxes frizzy, uncontrollable hair. You end up with gorgeous waves in the morning. For frizzy roots, use a drop of hair oil. I personally use a Ouai Rose Hair oil at my roots to control frizz at the top of my head because its sweet smelling and doesnt appear oily. You can also use Macadamia, Morocconoil Oil, L'oreal Elvive hair oils, or even just a small drop of coconut or almond oil. It all mainly depends on the aroma. Make sure you apply the oil from underneath the hair rather than topically to prevent appearing oily. This also adds extra nourishment. I can't count my blessings enough for this experience. This was sponsored by Influenster, Marc Jacobs and John Lewis. 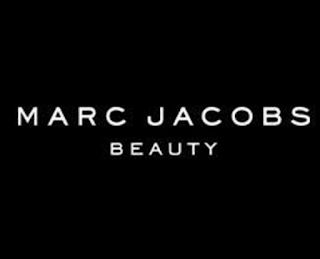 I had a wonderful complimentary makeover in store at John Lewis and received a deluxe sample of the Velvet Noir Major Volume Mascara by Marc Jacobs. I've been using the Rimmel London x10 Volume Flash mascara for a few months so it is great to try something different. My mom and I arrived 30 minutes early at John Lewis on Oxford Street as I couldn't trust public transport to get me there on time and I was tremendously excited. I was met with the lovely and beautiful Chloe who guided me through the what, why, and how process of the makeover. What I admired most about her as an MUA is that she was very considerate of my natural features and worked to enhance rather than change or manipulate. Chloe ensured that every decision made was something I would be comfortable with. Truly, she made me feel like a princess despite having to manage sales and other costumers whilst tailoring to my needs. It was initially scheduled to be 15 minutes, but she kindly granted me one hour; being very thorough throughout the procedure. 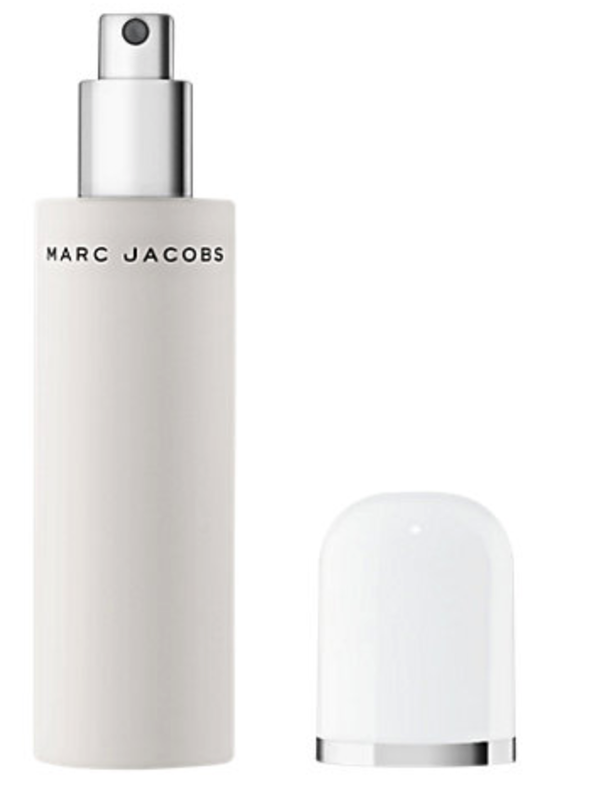 A majority of the facial products used were a part of the Marc Jacobs' Coconut range. 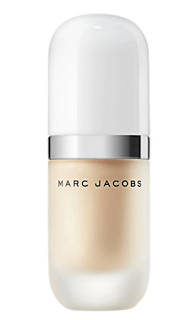 The aim is to achieve high coverage but hydration without looking sweaty, wet, or oily. 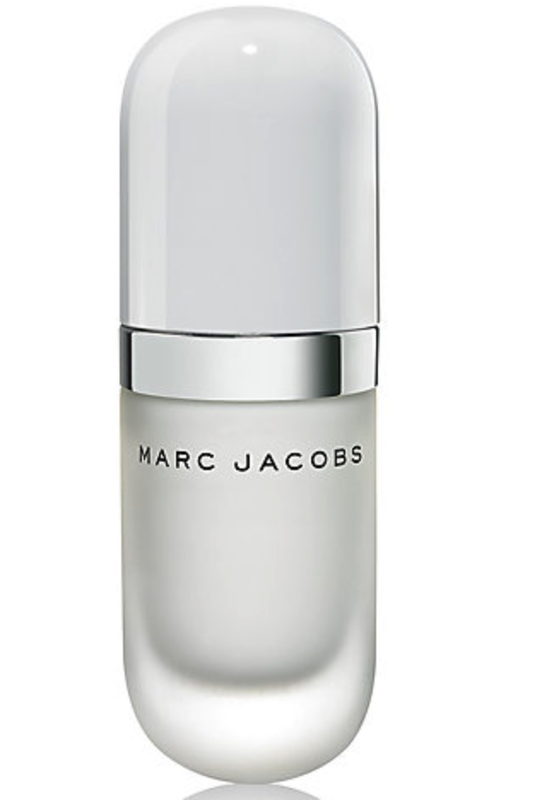 This primer really felt cooling and the finished face looked youthful. 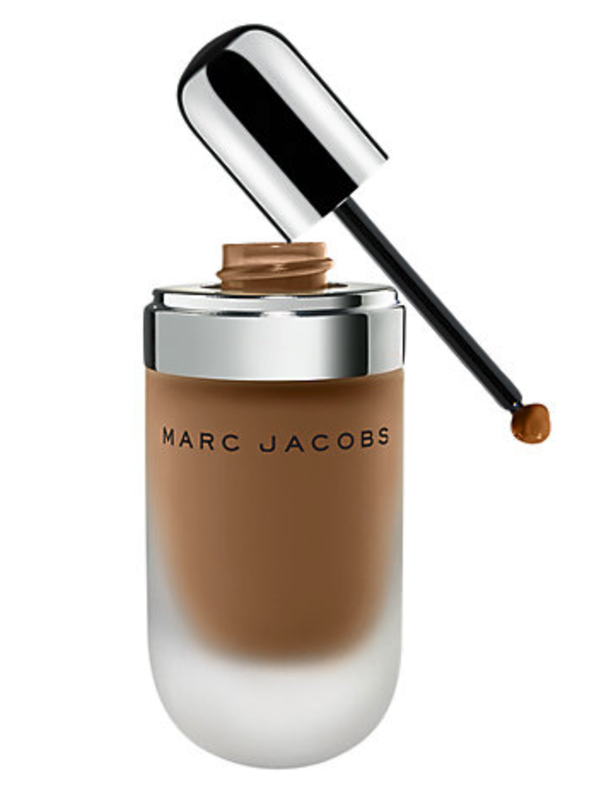 The foundation used later was applied with ease; showing that this primer was a phenomenal base. I am not one to use facial primers as they are quite expensive most of the time, but they do take your makeup look to the next level. There are five forms of coconut involved in the production of this product: fruit/pulp, water, extract, milk, and polysaccharides. Each play a different role to ensure the foundation does not move, transfer, hydration, evening/smoothing of the skin, and blur out imperfections. 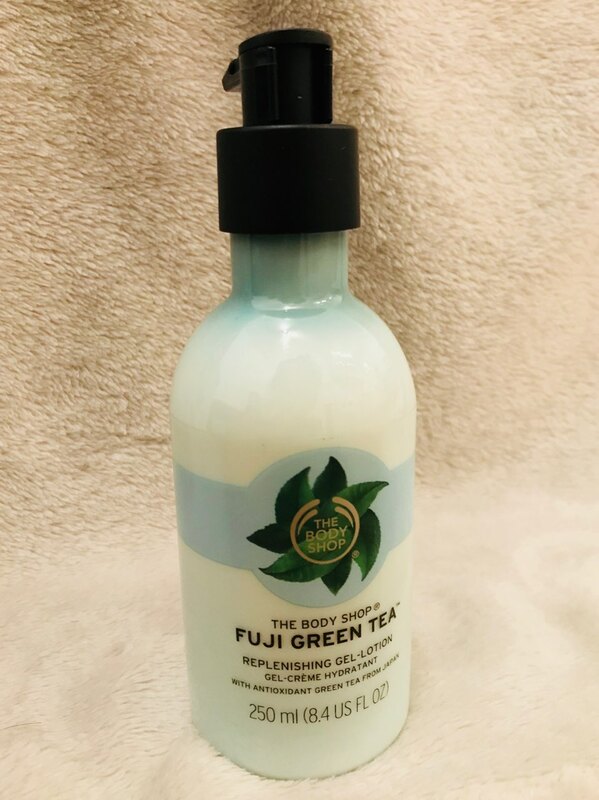 If you are someone that is quite lazy with your skincare but still love using foundation or primer on a daily basis, this is highly recommended as it works to nourish your skin with vitamins and antioxidants. In addition, it comes in a pump applicator which I always prefer for hygiene purposes. This. Is. Full. Coverage. The foundation is 42% pigment making it one of the highest pigmented foundations you can buy. 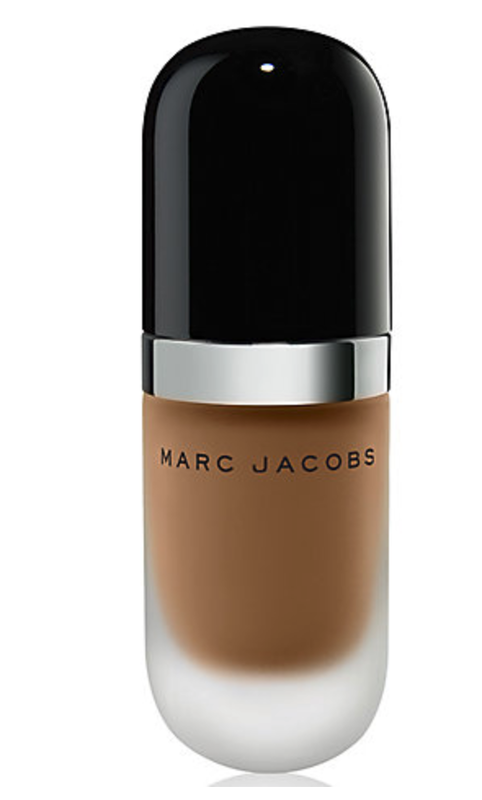 I'm usually very hesitant about foundations because they feel heavy and uncomfortable. I find myself consciously aware of its presence; hence, I avoid them like the plague. To my pleasant surprise, this foundation is practically weightless. Chloe had initially applied what I believe is half dime size (or 10p coin) worth on my face. As we progressed, she noticed that the foundation was becoming ashy quickly. She took off the foundation and then reapplied a lot less (perhaps 1/4 of a 10p coin) evenly across my face. 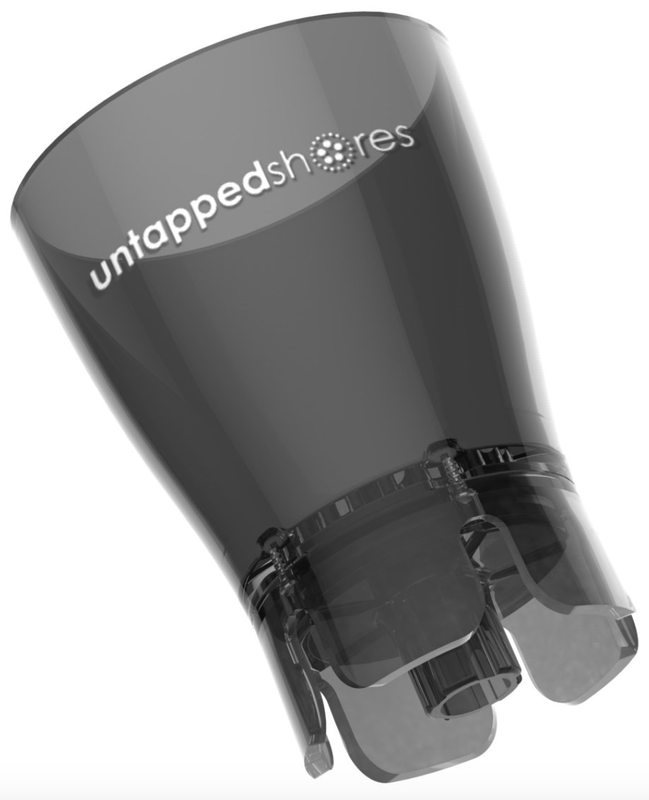 The dot applicator enables you to avoid wasting product for buildable coverage. Therefore, I highly recommend going in-store and requesting to try the product out and be matched rather than buying online because the foundation does indeed oxidise about a 1/2 to 1 shade after application. Like most brands bar Fenty, there isn't a range of options for deeper skin tones. I believe my perfect color would have been between 'Honey Deep' and 'Cocoa Light' but obviously that option is not available. Thus, we opted for a warmer shade to match my neck but I found that it did blend in like a charm. As I've mentioned before, I suffer with tired, dull and dry looking skin. This foundation did indeed add more light and radiance to my face which I normally don't see achieved in other foundations I've tried out, hence why I move towards lighter coverage BB creams. It contains luxurious ingredients such as golden mica (patented), jojoba, sunflower and acacia. Nevertheless, after a few hours I found that it became ashy around the mouth area. This is the product I fell in love with the most. 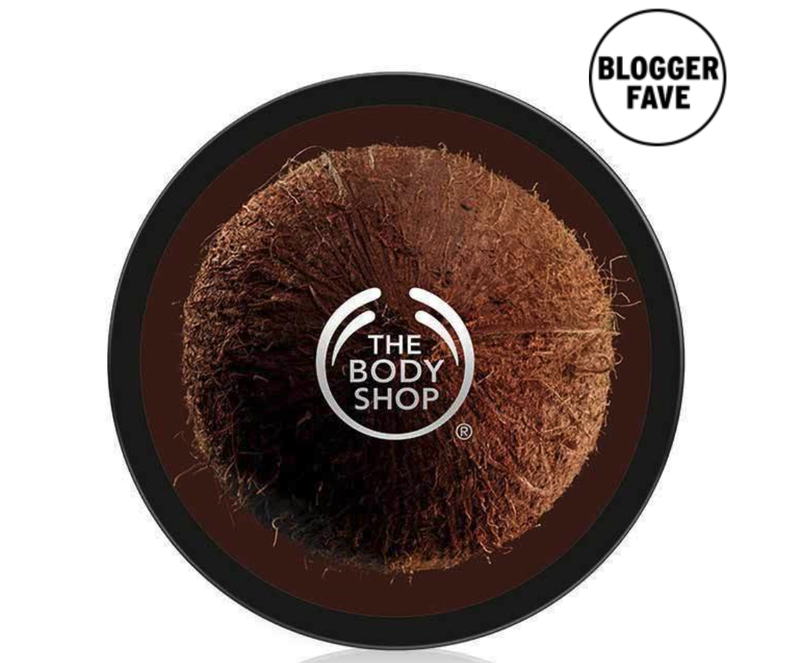 Not only does this product contain the 5 types of Coconut mentioned earlier, but it also has Provitamin B5 to help improve hydration and nourishment of the skin which usually struggles with frequent makeup use. Illuminizers are the best way to achieve dewy and glowly affect without having to consume 10 litres of water (I am not endorsing cutting back on your water intake though- this is a makeup elixir not a health fixer). 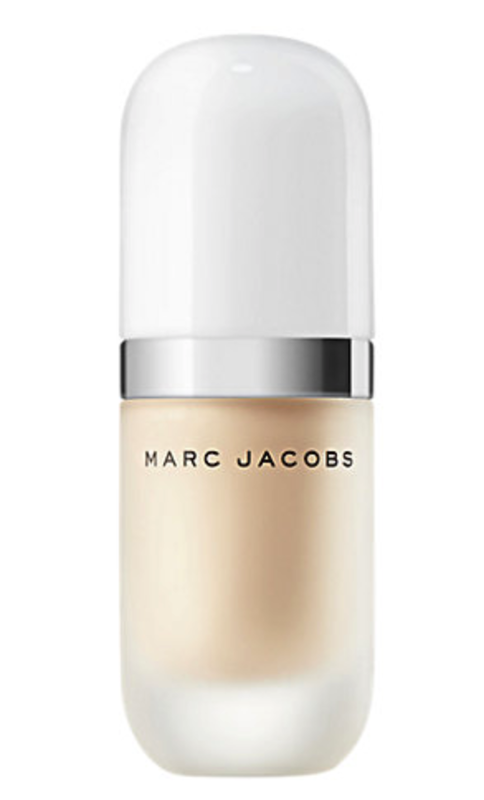 I love that it has a golden and peach undertone to compliment adding warmth to all skin tones. Regretfully, I forgot to take a picture of a swatch of it on her hand but nevertheless I highly recommend checking it out if you go in store. As I was getting my makeup done there were quite a few people checking out this illuminizer. Chloe used this on the high points of my cheeks, brows, and cupids bow as well for definition. In addition, mixing this illumizer with the foundation enabled the color to be more complimentary to my natural skin tone by slightly lightening it to produce a shade that would slot between 'Honey deep' and 'Cocoa Light'. We all know I am very loyal to my ELF Eyebrow Kit and cheating on it breaks my heart. This pencil does indeed fill in my brows, adding definition and shaping but remains natural. Chloe also used a brow gel by Marc Jacobs which is known for being one of the best for its brush, working to slick the individual eyebrow hairs into place. In addition, there isn't too much gel on the product which prevents the shiny-brow look which is not quite on trend. 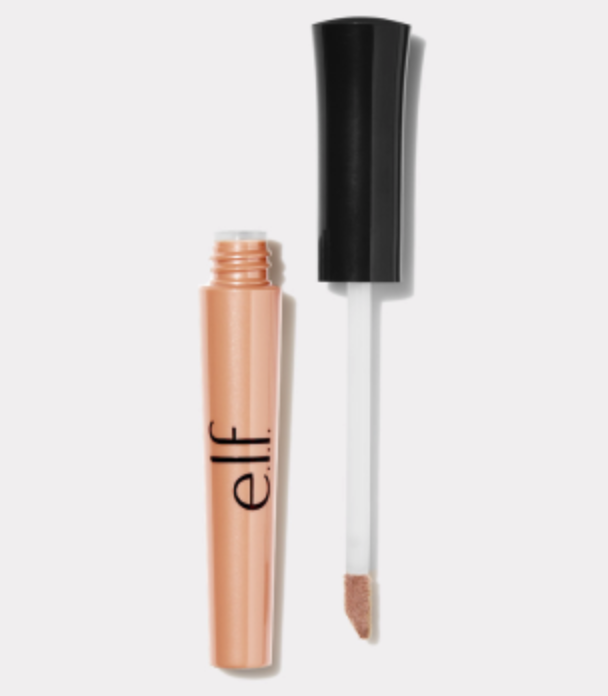 I've recently mentioned loving the ELF Primer for those who don't want to break the bank. I felt that the primer worked to provide a smooth application and canvas for the eyeshadows. Furthermore, prior to application it appeared to even out the skin tone on my lids to allow the shadows to stick on. It acts to absorb the oil on your lids to ensure that you have a good canvas for your makeup. There is literally no creasing, fading, or smudging of the eyeshadows which is super impressive as if I want to go bold, I always use eye makeup instead of going heavy handed with contour and blush. These eyshadows are wonderfully buttery and velvet upon application. A little goes a very long way when it comes to these palettes to provide a very pigmented eye look. Therefore, it is worth every penny as you do not need to go heavy handed. It's refreshing to just dab a brush into an eyeshadow rather than dig in. She used shade number 1 on my whole lids and I believe shade 2 in the crease and outer corner for a sultry smoky eye which is my go-to. Shade 1 was used as in the outer corner. This has a deep berry undertone which complements deeper brown skin tones very well. glamorous despite having done this on a Sunday afternoon. It was extremely glam. It's a cream and liner in one, infused with pure alpine snow water from the Swiss alps, providing added hydration alongside the eyelid primer. The application of this eye liner was easy and smooth. It glided onto my lids and waterline to add definition to the eyes. It's definitely opened my eyes to using dark purple liner instead of black eye kohl as the purple is softer and less intense. I tend to tear up when lining my water line but luckily this is waterproof. This was the star of the show. Marc Jacobs has come out with an outstanding mascara which finished off the whole entire look by adding 1800% more volume. The brush enables the roots of the lashes to be coated evenly with the mascara. Not only is it volumising, but it adds curvature, length and isn't weighed down as the day goes. The lashes do not look spidery rather it is fluffy and remains appearing soft. 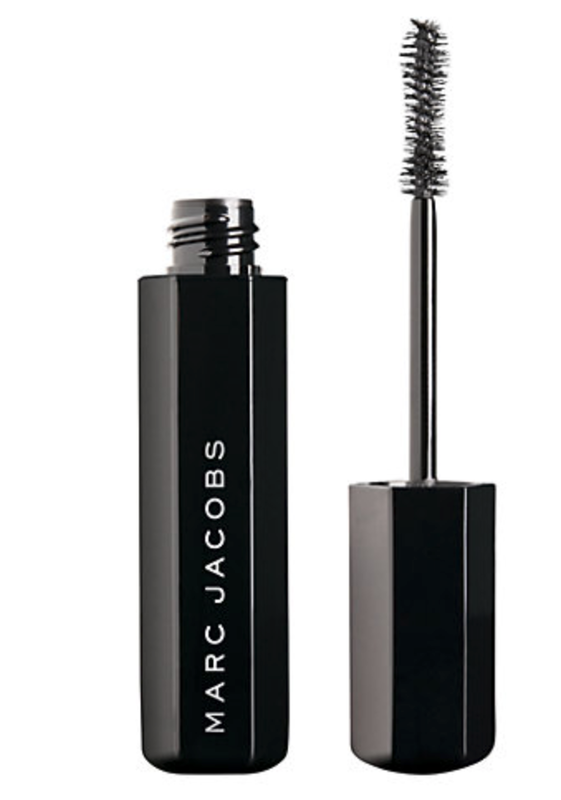 This is easy going to become my go-to once my Rimmel London mascara starts to dry up. Chloe was wearing a stunning lipstick in the colour 'Dashing' that I was very tempted to try. Rest assured, she found a shade that would be better suited for my skin tone. The color 'Goddess' is a warm toned red where the image here fails to display. I took a picture of my lips for you guys to get a more accurate impression about the color shade. 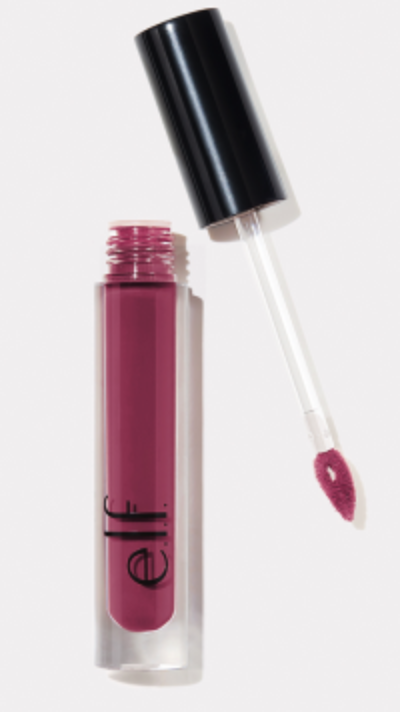 It feels buttery and creamy on the lips and evidently did not accentuate lines on the lips. It is a highly pigmented lipstick which worked on my naturally darker lips. 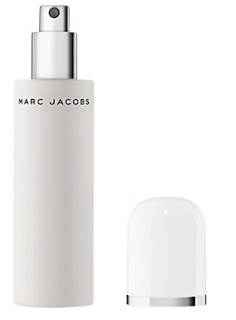 At the end of any makeup look, a setting spray will ensure the look stays weatherproof. It further enhanced the main elements of dewiness and hydration. It contains the same five coconut active ingredients to ensure there is no stickiness and your skin doesn't suffer underneath the makeup which is the usual case with regards to other foundations. Nevertheless, I feel makeup is moving towards the organic, vegan, and healthy approach as there are brands that offer these three aspects without hefty price tags. 1:30: Makeover's done! So incredibly grateful to have had one hour of pure effort by Chloe compared to a rushed wham-bam goodbye ma'am session. I'm in love with the finished look. It doesn't feel like I have any make up on my face. 2:30: Whilst taking pictures, it appears slightly ashy around the mouth area but nothing too drastic. I think this is a result of oxidation. I feel that colour corrector would play a great role in this case. Nevertheless, I find that it isn't too intense to feel embarrassed in public about. 4:00: Finally home and looked at myself in the mirror. The ashiness does not seem as intense as it appeared in the camera of my phone. I remain looking glowy and even toned. It appears to be staying strong with no signs of breaking, fading, or smudging. 5:00: I'm beginning to see wear around my cheeks where the patches are appearing slightly gray and around the mouth area. This emphasises the fact that color corrector mixed into the primer would've been very handy in the longevity. 7:00: It has slightly worsened since 5pm but again, it only requires light touch ups but I am not one to wish to do that as I am far too lazy to maintain my appearance throughout the day (bar lip balm). At this point I do wish to take off my makeup, also because I have uni in the morning so I need to shower soon. Overall, I do think the wear on this could be very exquisite with the help of a color corrector if you have a deeper skin tone. If you are more on the fairer end of the color spectrum then I can't find this foundation being anything buy re(marc)able. It is weightless, long lasting (advertised to be 24 hour longevity), and makes your skin feel and look youthful, radiant, and healthy. 1:30: The lip looks phenomenal. I never wore such an orangey undertone based red lipstick with so much confidence. It complimented my skin tone wonderfully. In the picture above, it appears that the lipstick is fading slightly on the bottom lip. 2:30: The lipstick bleeds slightly but is nothing abnormal. It is advertised as 8 hour wear, which I do believe it is indeed weatherproof. It did transfer onto coffee mugs. 4:00: I bought some chicken wings for lunch and let me tell you, the lipstick is not chicken-wing proof. It most definitely has faded considerably but with such finger food I would be more than surprised if it soldiered through my eating. That's what matte liquid lipsticks are for! 5:00: There is slight traces of lipsticks in the middle of my lips but otherwise I think there is very little visibility of the lipstick and complete reapplication would be necessary. I really do not think that a time line is required for either of these because they literally look like a carbon copy of each other from 1:30pm to 7pm. It is highly probable that they both can wear a lot longer without budging. I am highly considering the eyelid primer. A good base provides perfect application after all. In essence, that is the break down of what happened on my little Marc Jacobs Beauty Experience at John Lewis. I truly did enjoy every second and do not be surprised if next month, the mascara or other products are featured in my favorites. 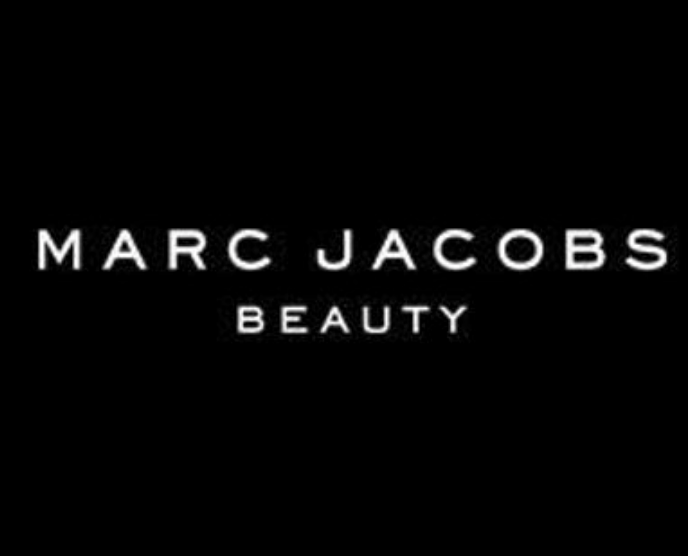 Be sure to check out the Marc Jacobs' beauty line here or in-store. Another month of new products in my stash and now I can't help but use them on a daily basis. These products have readily become a staple in my routine. 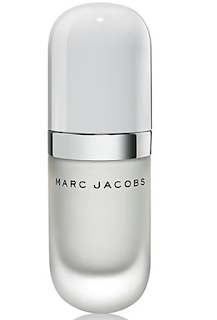 This was the very first eyelid primer I used. At the time, the Urban Decay Primer Potion was blowing up on social media. Being a 14 year old with very few pennies in my pocket, I couldn't help but look for a cheaper alternative. 7 years later, I am still repurchasing the same eyelid primer. The eyeshadow does not budge and is long lasting. Nothing smudges and I look as fresh as a daisy at the end of the day on my eyelids. I am always skeptical with overly priced, daily-use products. 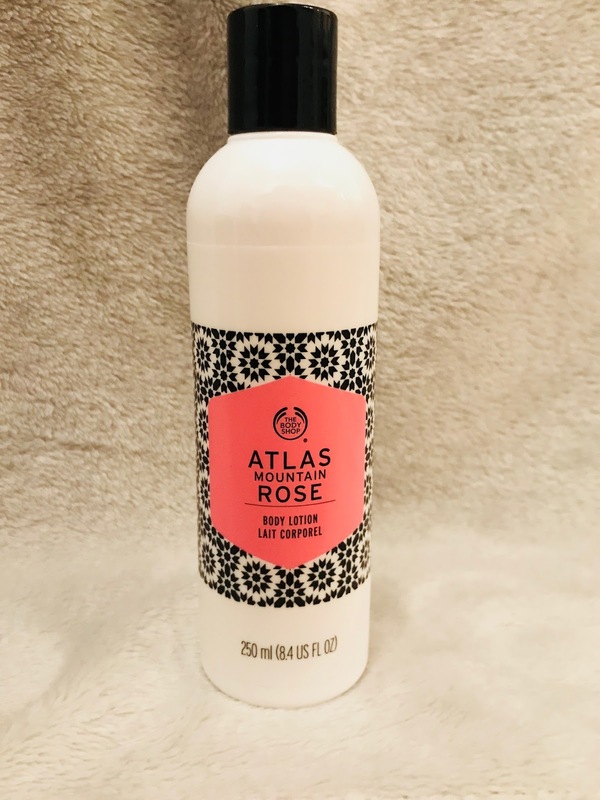 This lip conditioner's aroma is that of a beautiful and fresh bed of roses. It certainly feels luxurious on the lips; eliminating chapped cracks instantaneously. When I feel my lips are struggling from over-use of liquid lipsticks, this is a very refreshing therapy. Although I am hesitant on purchasing the product in the future due to the price, I do recommend it to those who can afford it. Washing my hair is the bane of my existence. As it is so thick and unruly, washing it is extremely stressful. I wish I could say I resemble the girls in shampoo adverts, but instead I come out red-eyed with tired forearms. It truly is a work out. Therefore, dry shampoo is my saviour on lazy days. This one smells delightful and isn't too expensive though there are cheaper alternatives I enjoy using too (such as Batiste). Although it is slightly on the higher price mark for dry shampoos, it does smell lovely and is easy to rub out. It take's away the oil slick that tends to build up at the roots with fast absorbance powers. 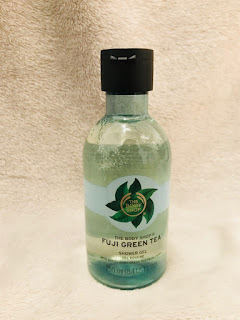 I felt that four sprays was more than enough at my roots to get rid of all the excess oil. Unfortunately, I left all of my perfumes back in America prior to my move to England. This was highly saddening as all I had was deodorant. 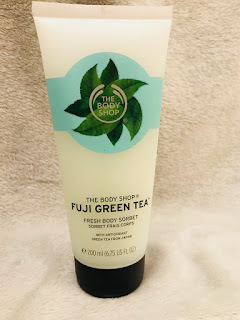 Thank goodness that my good friend came to the rescue and had gifted my mother (I'm 'borrowing' the body butter) a Body Shop coconut gift set (purchase here). I absolutely love how this butter leaves my skin feeling glorious throughout the day and the scent isn't too overpowering but lasting enough. Personally, my main aim was to smell neutral or good with my lack of perfume options. I absolutely love the Body Shop body butters so this was for sure a hit I've been using every morning of October. I never thought I would be someone that would fandom over a 'Jersey Shore' item but here I am. 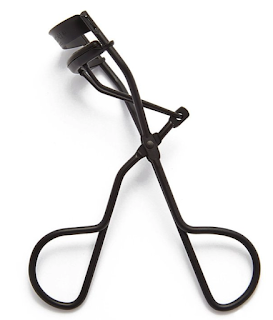 I got scent this Eyelash Curler in a Test Tube beauty box. I was using an ELF eyelash curler for over 7 years and only changed the sponge once. Thus, to have a new one was quite the present. I find that it does indeed curl my eyelashes, giving them a very natural lift from the roots and holds in place throughout the day. If I want to give my lashes a break from mascara, I will just curl them and head out the door. 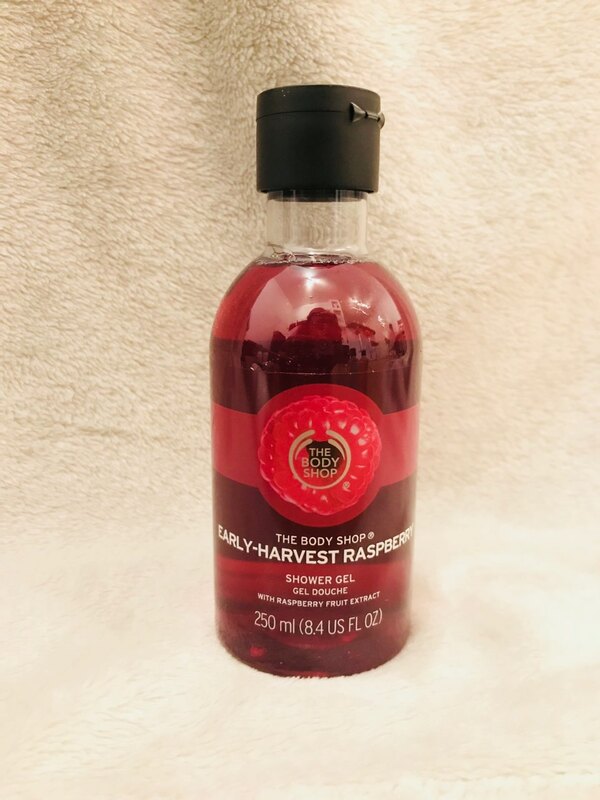 I have loved The Body Shop since the day I moved to England. Despite being a high street brand, they stand against animal testing and are 100% vegetarian. 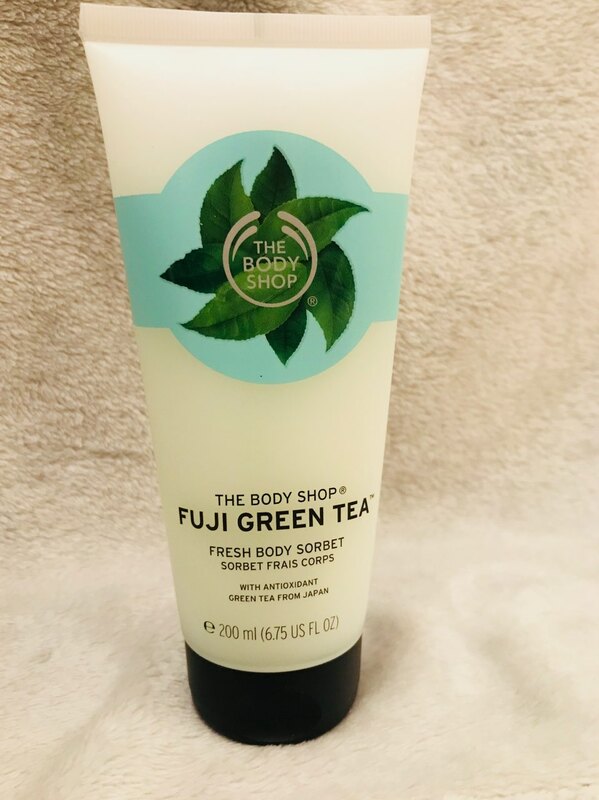 I use to miss Bed Bath and Beyond or Bath and Bodyworks in the states, but having The Body Shop replaced those stores quickly. You get more bang for your buck as the quality of the products are top of the range and long lasting. For example, I find myself being able to salvage 50mL body butters for over a month. The products feel and even look luxurious; making me feel like a princess every time I use them. 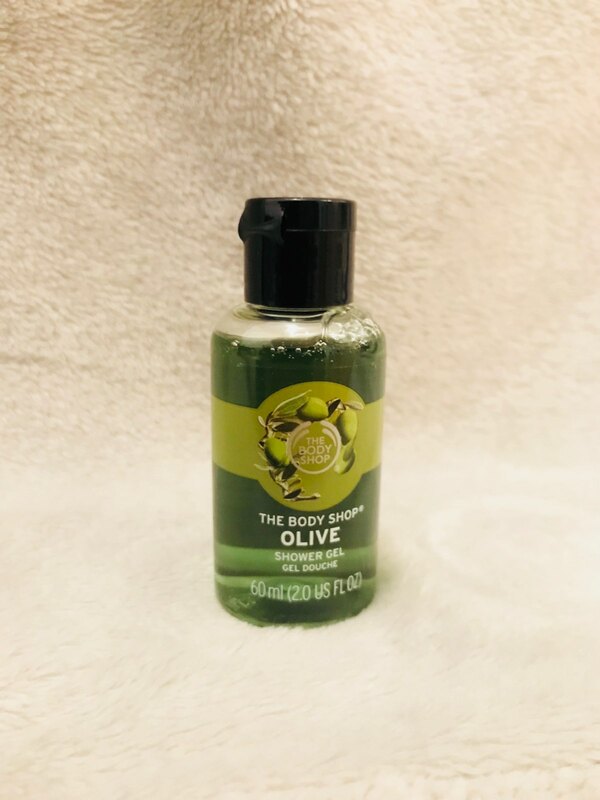 I had the blessing to acquire quite a few Body Shop products. I wanted to put up my monthly favorites but felt it was very important to get this up ASAP as there is an amazing sale going on online. Plus, I've not had a haul up on my blog since my ThredUp one which you can find here. 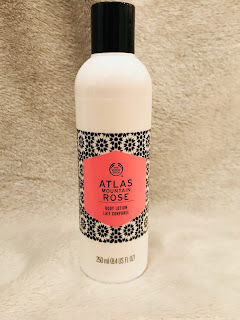 I'm very lazy about body lotion. Sitting idle with nothing but lotion just seems like an unappealing way to pass time whilst waiting for it to absorb. It's a literal experience of watching paint dry. These lotions will hopefully change my retched ways. The consistency of the body lotion is very thin so it's easy to apply and rub into the body compared to a butter. The scent is very strong and lingers throughout the day. You can skip the perfume or pair up each of the lotions with their corresponding perfume to extenuate the aroma. Roses have always been one of my favorite smells and flowers. The scent of this is a beautiful floral rose, with no hint of sweetness or musk which I usually find overpowering. The balance of tones is phenomenally done to mimic the flower's aroma. 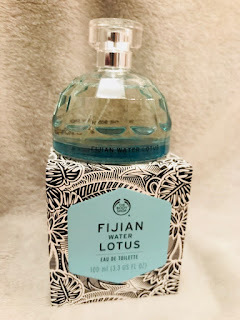 I've used the perfume and body mist version of this scent for years as I've mentioned in previous blog posts. Jasmines have always been my number one favourite flower and scent. 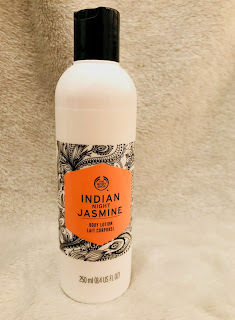 Although I can't apply this in my hair, it reminds me so much of my Indian roots and will be one that I reach for on a daily basis. This is extremely refreshing. Surprise surprise, the lotus flower has been a favorite of mine since I was a little girl. I know I've basically said that about each of these scents but it's not my fault that my all time favorite flowers are, indeed, lotuses, jasmines and roses. It's just a very happy coincidence! I love how this does wake me up in the morning and as I have the corresponding perfume, I am excited to pair them up. I'm usually not one to splurge on shower gels because shower gels tend to be used up quickly so spending extortionate amounts never seemed logical. However, these were hard to miss. 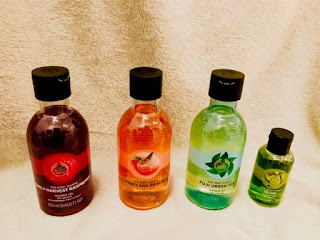 I find that after using the Body Shop shower gels, the scent (a word which I feel is being overused in this blogpost) does tend to linger for a few hours after. It saves you for the day if you missed your spritz of perfume. This is spot on. 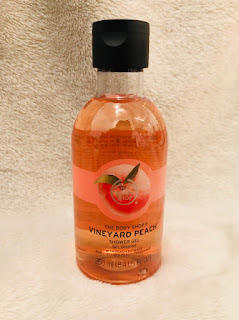 This fruity scent is perfect for those who love spring and summer. It isn't overwhelming or too strong compared to the others. This is very strong. The scent is potent and reminds me of ribena but I am still very fond of it. After all, raspberry lemonade is my favorite drink. This is a musky, revitalising, and subtle scent. It does have an herbal undertone but it is one which I would enjoy waking up to. This olive scent is not how I expected it to be. I absolutely love olives but I was hasty on this one because I assumed it would smell like olive oil. Nevertheless, the aroma is sweet but relaxed. It is subtle and has a fruity undertone. The scent is very musky but refreshing. It almost has a lemon scented undertone to it, similar to freshly washed laundry. Though thicker than the body lotions, it is still light weight and not uneasy to wear or blend. It absorbs quickly, so we get to skip the awkward lingering around before we can wear our clothes. The texture is unsurprisingly gel-like, as the name suggests. It does absorb very quick and is about the same consistency as the sorbet. The scent is not as overwhelming but it does feel softening and refreshing. It is perfect for tired, lazy mornings where you just want a wake up call. 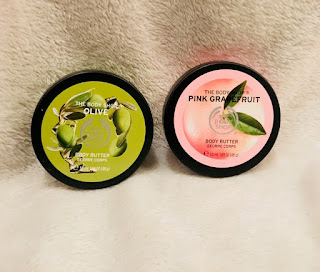 I usually do not love very thick creams but I find that these body butters feel wonderful and blend into the skin well. It is not difficult to rub in and works wonders on dry skin which I suffer with. This is said to hydrate the skin for 48 hours, which I do find to be true. I usually rub these in from the neck under so it can double as a perfume. My skin does feel significantly softer and prevents the formation of dry patches. The olive body butter has more of a baby-powder and sweet scent compared to the pink grapefruit which is extensively musky and citrusy. It heavily resembles Orangasm by Soap and Glory if you are familiar with that smell. A little goes a long way in terms of longevity. Like I mentioned earlier, lotuses are one of my favorite flowers. I was beyond excited to receive this perfume. It is so light and refreshing. After just two sprays, my mom could smell it as it filled up the living room. The main accords are: marine (sea air), citrus (mandarines), floral (from damascus rose), aromatic, and aquatic. I have always enjoyed aquatic tones in perfumes. However, I feel that to say it has a 'citrus' accord is quite surprising as I did not find it very citrusy. The sillage (the length and degree to which a perfume lingers) is most certainly softer with a stronger longevity, comparable to my higher end perfumes.